The concept of lean is increasingly being applied in various types of service industries. But how did alltime lean champion Toyota take the lessons it learned from manufacturing and apply them to services? 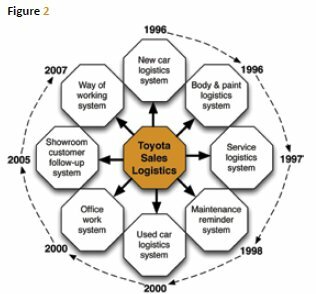 Niklas Modig, Ryusuke Kosuge and Pär Åhlström of the Stockholm School of Economics discuss the development and characteristics of Toyota Sales Logistics. Although there is a wealth of knowledge and experience on lean in nonmanufacturing sectors, what is less known is how Toyota itself applied its celebrated Toyota Production System within the services. This despite the fact that it is almost twenty years since Toyota Motor Corporation started to apply TPS within the car dealer industry in Japan. 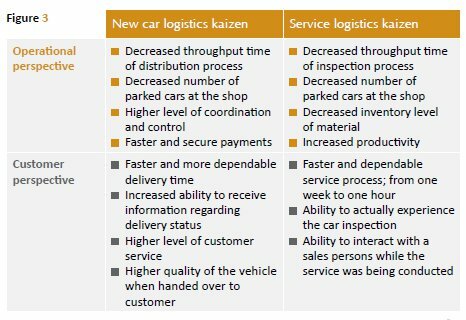 The concept known as Toyota Sales Logistics (TSL) is considered the most well-developed “Toyota style” service concept in the world. The Toyota car dealer industry in Japan is characterised by long-term relationships between TMC and approximately 300 independent car dealerships of which TMC only owns a very small share. The company therefore offers various types of support to the dealers in order to maintain a close and collaborative relationship with them. A dealership company normally consists of a head office, distribution centres, repair and renewal centres for used cars and on average twenty car showrooms. The head office coordinates and controls the operations between the different units and the factory. A newly produced car is delivered from the factory to the distribution centre where the final assembly of supplementary parts is conducted. The car is then shipped to the dealer for final hand-over to the customer. In Japan it is common that a car showroom offers both sales and service, which means that the dealer usually continues to have contact with the customer after a new car has been handed over. When the car is getting older the customer can exchange it for a new one. The old car is repaired and renewed and sold to another customer. The structure of the industry is illustrated in figure 1. The Japanese car market grew steadily until the end of the 1980s. By using strong financial incentives, TMC encouraged the dealers to sell as many new cars as possible. After-sales activities were neither prioritised nor seen as important compared to selling new cars. Every sales person was focused on maximising performance in terms of sales outcome. The level of coordination was very low and there were not many standardised procedures. Similarly, service technicians were doing their job in a discretionary manner. Lack of standards and under-developed routines made it difficult to manage and plan the service operations, and the outcome also varied a lot between different service technicians. After the economy collapsed in 1989, the market for new cars became sluggish. The low level of sales, productivity and service revenue became apparent. In this context, Toyota set out to improve the dealership operations. Akio Toyoda, the current CEO of Toyota, recognised that the dealership business was full of waste and faced severe quality problems. 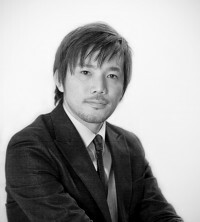 He saw a big potential in applying TPS within the various service processes: in 1995, through close collaboration with selected dealers, experienced manufacturing experts started developing a new service-oriented concept, Toyota Sales Logistics, which today is the leading “lean service” concept in Japan. The overall intention of TSL was to increase customer satisfaction, through continuously improving the flow of people, cars, parts, information and money. More specifically, the aim was to increase quality, develop stable and short lead times and dependable deliveries. The customer should be the main focus. Achieving this implied a chance to improve productivity and customer retention. 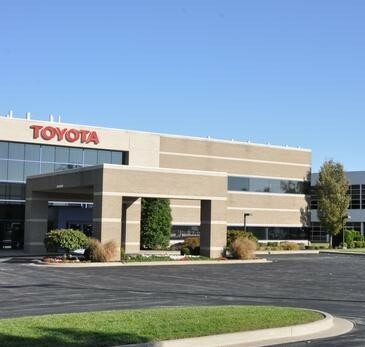 The development of TSL took place sequentially, through what Toyota itself calls “systems”. Basically these systems are directed to various kinds of key processes within the car dealer industry. Toyota started with the most severe problems, using a few car dealer shops as a test ground, and by focusing on one process at a time it developed, tested and improved the various systems. These systems were then spread to the rest of the Toyota dealers in the form of “packages” of training, support, methods and tools. The various systems and their development are illustrated in figure 2. In order to illustrate how TPS has been applied within the car dealer industry, we briefly describe the development of two systems below. New car logistics system. This system basically handles the process from order to the delivery of new cars. The process starts when a customer has signed the contract at the dealer shop and ends when the car is delivered and payment is finalised. Prior to the development of the TSL system, it was common for dealers to lack control over the distribution process. The process was characterised by an inefficient flow of information between the different units resulting in an even more inefficient and unpredictable flow of cars. Each unit only focused on its part in the delivery process. The coordination between the units was almost non-existent. As a result, sales personnel found it difficult to provide accurate information to the customers on when the cars were to be delivered. The confusion and lack of confidence in the system made the sales personnel deliberately delay the hand-over date, which resulted in a situation where a lot of cars were waiting to be picked-up. This demanded a lot of space at the car showroom. Long waiting time, inaccurate information and defective cars made customers very unsatisfied. 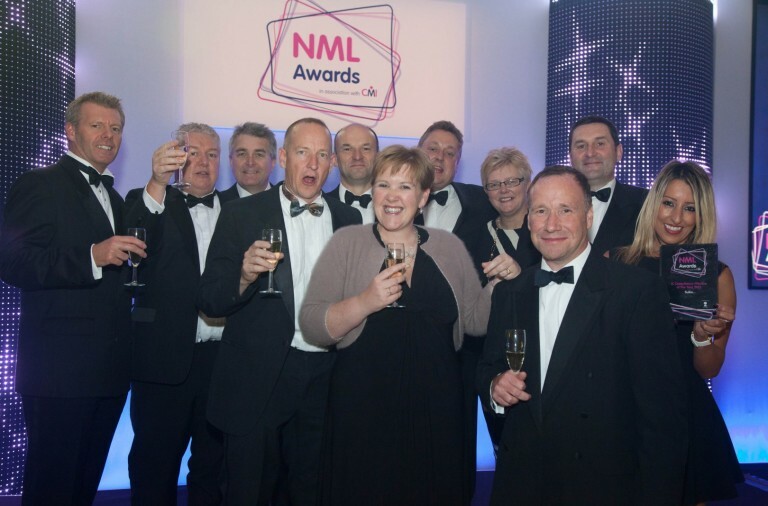 The TSL system took a total process perspective and developed a highly standardised and transparent procedure, which allowed a shorter and fixed delivery time. Irrespective of where a car was in the distribution process, each unit could continuously follow and control the progress. Information was communicated through different visualisation boards that were continuously updated, displaying the exact delivery status of a specific car. By referring to the boards, everyone could pursue progress control and thus prevent anticipated problems or solve the problems before they reached the customer. It was now possible to deliver highquality cars rapidly. The standardised and visualised process allowed the sales people to have a close and clear interaction with each customer. Service logistics system (car inspection). In Japan car inspections must be conducted three years after the purchase of a new car and every second year thereafter. 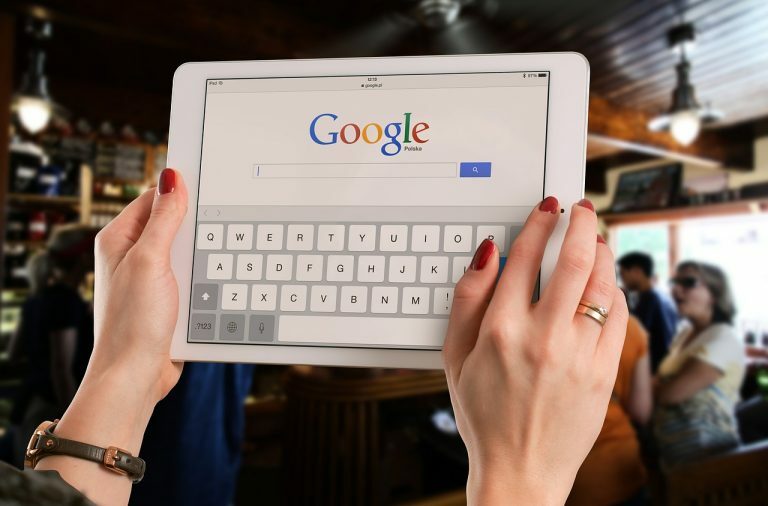 Traditionally, car inspections would involve a dealer employee picking up and dropping off the car at the customer’s home. However, since the technicians who carried out the car inspection were often very busy, it could sometimes take several days before the inspection started. This, together with the fact that land is a scarce resource in Japan, led to many problems associated with over-crowded parking lots. Cars had to be moved back and forth all the time and they were sometimes damaged. A single technician would conduct the actual car inspection. Even if the actual inspection took three hours, it usually took a few days before the inspection was completed because the technician would often work with different cars at the same time. The actual content of the inspection was standardised by law, but the procedure followed no exact sequence or routine. Every technician had his or her own unique approach. The lack of standards meant that the inspection process was difficult to manage and predict, which led to planning difficulties. Furthermore, the quality of the inspection varied greatly between different technicians. Still, the technicians were all working hard since they always had something to do. They even had to work a lot of overtime. The traditional system also involved problems in relation to a lack of information, unnecessary work, excessive inventory of parts, errors and mistakes, waiting time for facilities or equipment and low level of coordination and control. The inspection process was like a black box. Consequently, customers usually had to wait up to a week for their cars even if the actual inspection only took a few hours to complete. The new process aimed to offer a car inspection performed at the car dealership while customers waited in the showroom for the service to be completed. The result of a long development process was a 45-minute inspection process. 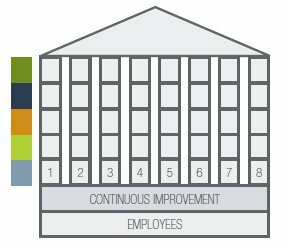 A standardised process was developed in which the sequence and duration of every activity and task were fixed. All necessary tasks were identified and standardised. Standard scripts and charts were developed for every task and everyone was thoroughly trained and educated in order to master the new team approach. The knowledge and capabilities of each worker were measured in a competence matrix. Instead of having one technician conducting the entire inspection, the new approach involved a team of one inspector and two technicians. Two technicians worked together on the car, with one responsible for the lefthand side and the other for the right-hand side, while the inspector controlled the progress of the whole process. A new layout was developed to eliminate the need for movements within the inspection area. 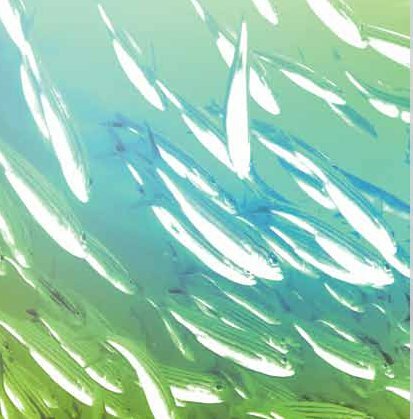 New specialised equipment was also developed in order to eliminate the most severe bottlenecks within the process. Various visualisation boards and sheets were also used, showing the current status of different activities and their outcomes. The standardisation and visualisation meant that everyone always knew what to do. It also allowed everyone involved to easily identify when things were not conducted in a timely or correct manner. Both standardisation and visualisation increased the level of control. The new car inspection process had several benefits. From an operational perspective, the throughput time was much shorter. The number of parked cars at the shop decreased, as did the inventory level of parts. Since the length of the car inspection was fixed at 45 minutes, capacity planning of the whole workshop became much easier. The shop was able to achieve a good balance between utilising capacity and securing free capacity in order to retain its flexibility. This provided a more stable workload and less stress for technicians, and it also increased the manager’s ability to control the operations. From a customer perspective, the new approach offered a faster and much more dependable process that now took only 45 minutes, as opposed to approximately one week. It also offered customers the ability to actually see what was happening to the car while it was being inspected. The customer could receive accurate and instant information regarding the various activities and their outcomes. This also allowed sales staff to interact with customers and further develop their relationship with them. Flexibility also increased due to increased planning ability; customers were offered flexible pick-up times and flexible scheduling for the car inspections. They could plan for and cancel their car inspection with shorter notice. There have been a number of positive effects from the development of TSL, as described previously. The operational changes had various effects, which are summarised in the figure 3. The processing of physical resources (cars, parts) could be conducted faster with higher dependability and information regarding the process could be accessed instantly. This allowed the personnel to offer fast and dependable services, in combination with a possibility to provide the customer with accurate and instant information regarding the various processes and their respective outcome. As a result, customers got what they wanted on time, in less time, which in turn led to faster settlement of payments. Another effect was a decrease in the number of cars being parked at the shop and in inventory levels of materials. The flexibility was also increased due to increased planning ability; customers were offered flexible pick-up time or flexible scheduling for the car inspections. A key theme in all the various systems that TMC developed as part of TSL was how strongly these systems related to the core of the Toyota Production System. Basically, what the experienced manufacturing experts did was to apply their intimate knowledge of TPS to car dealership operations. Toyota does not make any adaption of TPS when using it within the service context: it is about developing operations with a strong customer focus. 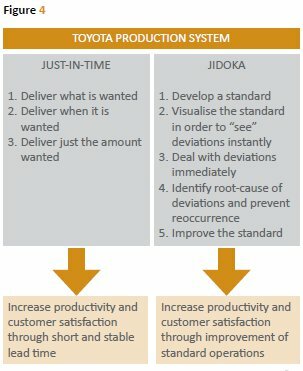 According to TMC Japan, the Toyota Production System consists of two pillars: just-in-time and jidoka. 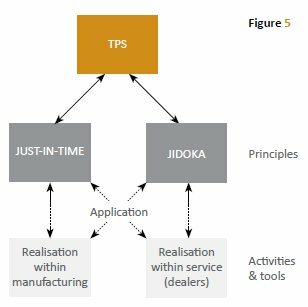 The aim of just-in-time is to create a standardised process delivering what the customer wants, when the customer wants it, and in the amount wanted; jidoka’s is to pursue abnormal control of the process, which means to create an operational system that instantly identifies deviations from the standardised process. The deviations (abnormalities) are identified through visualisation and continuous control of the progress of the process. Once a deviation is recognised, the root of the cause is identified and proper countermeasures are undertaken in order to prevent reoccurrence. Even if just-in-time and jidoka are defined and handled separately, they are interdependent and can be considered to be part of one dynamic system. The principles strive to realise two different sides of the same coin, namely the development of system normality (just-in-time) and the development of a system instantly identifying abnormality (jidoka), which in turn triggers the improvement (re-development) of the system normality. Together these two principles are the engine driving continuous improvement. TPS is illustrated in figure 4. As described, TSL is in concrete terms a collection of activities and tools, such as kanban cards, stock control posts, pacemakers, work sequence list, progress visualisation boards, etc. These are specific for the car dealership operations. However, the activities and tools were developed through the application of TPS. More specifically, they were developed through the application of just-in-time and jidoka. 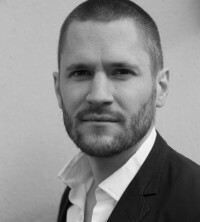 Just-in-time was applied through the development of standardised processes offering what the customer wants (defect-free car), when it is wanted (on-time delivery) and how the customer wants it (continuous interaction and high-quality service). Jidoka, on the other hand, was applied through visualisation, making everyone able to pursue progress control and instantly identify deviations (delays or defects) within the process. In conclusion, the way Toyota applies just-in-time and jidoka in service does not differ from how it applies it to manufacturing. It is the same principles with the same meaning. The way the principles are realised may however differ between contexts: TPS in manufacturing is about developing activities and tools to create flow in the processing of material and information. TPS in service, however, is about developing activities and tools to create flow in the processing of material, information and customers. 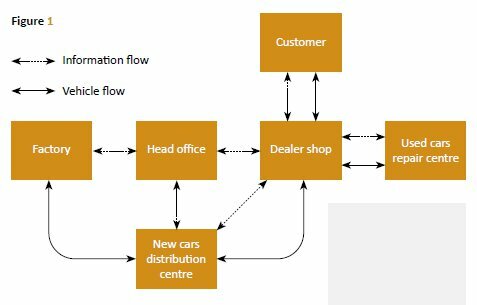 The various flows are integrated into a system, which in different ways produce good customer experience.